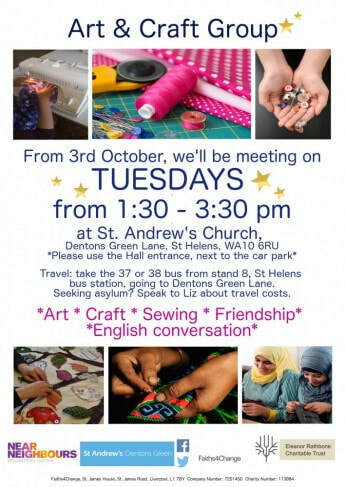 We worked with St. Andrew's Church and Our Warm Welcome in St Helen's in 2017/18 on a creative community cohesion project. Through the Wellbeing Space, a weekly arts and crafts group was created that continues to run, opportunities for integration and meaningful shared activity were created. The project brought together asylum seekers, refugees and local residents in a shared space. Participants learnt hands on creative skills, making everything from banners to embroidered bags.